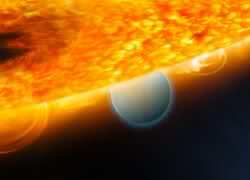 NASA’s Hubble Space Telescope has discovered carbon dioxide in the atmosphere of a planet orbiting another star. This is an important step along the trail of finding the chemical biotracers of extraterrestrial life as we know it. Previous observations of HD 189733b by Hubble and the Spitzer Space Telescope found water vapor. Earlier this year, Hubble astronomers reported that they found methane in the planet’s atmosphere.